GeIL (Golden Emperor International Ltd.) is a computer hardware parts manufacture, based in Taipei, Taiwan. Their main focus, since 1993, was in DRAM and flash based memory products. GeIL specializes in memory cooling systems as they concentrate on memory module design and manufacturing technology. The Company’s belief is that long hours of gaming or completing video editing projects, can raise the heat on your RAM memory slot. Well, thanks to the Cyclone 3 memory cooling fan, those worries are the past. 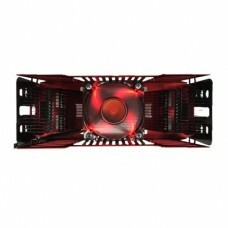 At Startech, we are proud distributor of GeiL products like the GeIL Cyclone 3 memory cooling fan. The cooling system is designed with maximized airflow while scattering and distributing air/heat equally, away from the RAM memory cards slots. The aluminum fan bracket of the Cyclone 3 is equipped with high performance cooling fin from underneath the fan extending to both sides of the fan. Also it has maximized air ducts on the bottom of the aluminum bracket for providing superior cooling performance.